On 11 September, the 3rd Battalion Headquarters and G and I Companies of the 504th PIR, along with the remainder of the 325th Combat Team, swerved south and landed on bloody Salerno beach. The military situation deteriorated with each passing hour as German Field Marshal Albrecht Kesselring (pictured right) began rushing troops and panzers toward the Salerno beachhead. Major elements of seven of the eight German divisions in southern Italy began a constant bombardment of the bottlenecked Allied units on the beach. The Allied hold on the beachhead became tenuous when, on 12 September, the Germans launched a successful counterattack. The situation became so critical that Gen. Mark Clark ordered the 82nd to prepare to drop directly on the beachhead. September 12th 1943 marked a turning point for the Allied forces. Savage fighting had erupted and raged all day. The dead and wounded began to pile up as the Allied front crumbled in places and units were cut off, overrun, and wiped out. By night fall the Germans had advanced to within 6 miles of the shore at all points. By September 13th 1943, General Mark Clark's Fifth Army had held tenaciously to the Salerno beachhead for four days but needed immediate assistance otherwise they were in danger of being pushed backed into the sea. Realizing the precariousness of his situation General Clark sent a message to Major General Ridgway requesting a drop that night. Immediately, a plan was conceived to drop the 504th PIR several miles from the embattled beachhead. Pathfinders would drop in first to mark the DZ by setting ablaze cans filled with sand and gasoline arranged in the shape of a "T". Meanwhile, on standby at airfields in Sicily, the 1st and 2nd Battalions of the 504th were alerted, issued chutes, and loaded on aircraft without knowledge of their destination. Receiving their briefing aboard the plane, the men were told that the 5th Army beachhead was in danger and they were needed to jump in behind friendly lines. Flying in columns of battalions, they exited over the barrels of gasoline-soaked sand that formed the flaming "T" in the center of the drop zone. The regiment assembled quickly and moved to the sounds of cannon and small arms fire within the hour. The plan worked nearly flawlessly with the exception of one company that landed ten miles off target. By dawn, all the units of the 504th were firmly set in defensive positions. The next night the 505th PIR led by Colonel Gavin arrived in a similar manner. The days that followed were, in the words of General Mark Clark, Commander of the 5th Army, "responsible for saving the Salerno beachhead." As the 504th (minus 3rd Battalion) took the high ground at Altavilla, the enemy counterattacked and the Commander of 6th Corps, General Dawley, suggested the unit withdraw. Epitomizing the determined spirit of the Regiment, Colonel Tucker vehemently replied, "Retreat, Hell! -- Send me my other battalion!" The 3rd Battalion then rejoined the 504th, the enemy was repulsed, and the Salerno beachhead was saved. The operation secured the flanks of the 5th Army, allowing it to break out of the coastal plain and drive on to Naples. On 1 October 1943, the 504th became the first infantry unit to enter Naples, which it subsequently garrisoned. The operation was not only a success, but it also stands as one of history’s greatest examples of the mobility of the airborne unit: within only eight hours of notification, the 504th developed and disseminated its tactical plan, prepared for combat, loaded aircraft and jumped onto its assigned drop zone to engage the enemy and turn the tide of battle. During the next several months in Central Italy, the 504th fought in difficult terrain against a determined enemy. On steep, barren slopes, the Regiment assaulted one hill after another. 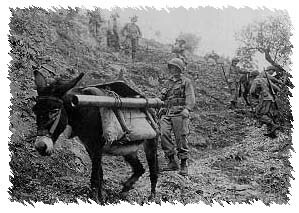 Mule trains aided in the evacuation of wounded to some extent, but casualties were often carried for hours down the steep hillsides just to reach the road. Finally, the 504th PIR was pulled back to Naples on 4 January 1944 as rumors of another parachute mission spread. The operation was to be called "Shingle," and it involved an airborne assault into a sector behind the coastal town of Anzio, 28 miles south of Rome. It seemed, however, that even the locals in Naples knew of the operation,so the 504th was glad that the beach would be assaulted from troop-carrying landing craft. The landing on Red Beach went smoothly -- at least until enemy planes started their strafing runs on the landing craft. The unit disembarked under fire and was sent shortly thereafter to patrol in force along the Mussolini Canal. After several days of intense German artillery fire, the enemy launched his main drive to push the Allies back into the sea. The 3rd Battalion was committed with the British First (Guards) Division in the heaviest fighting, with the paratrooper companies reduced in strength to between 20 and 30 men. H Company drove forward to rescue a captured British General and was cut off. I Company broke through to them with their remaining 16 men. For its outstanding performance from 8 to 12 February 1944, the battalion was presented one of the first Presidential Unit Citations awarded in the European Theater of Operations. On 23 March 1944, the 504th was pulled out of the beachhead by landing craft and returned to Naples. The campaign had been costly, but enemy losses exceeded those of the Regiment by over tenfold, and the Allies maintained control of the beachhead. Shortly thereafter, the 504th boarded the "Capetown Castle" and steamed to England.